Rouging of stainless steel is the result of the formation of iron oxide, hydroxide or carbonate either from external sources or from destruction of the passive layer. Color variation is a result of the oxide/hydroxide/carbonate type and variations in the water of hydration associated with the corrosion products. These colors range from orange to red to black. Bright red streaks on the surface of stainless steel usually are the result of iron contamination from dragging carbon steel over the surface, from welding carbon steel to the stainless steel, from iron contaminated grinding wheels or steel wire brushes. In untreated water the discoloration may be the result of oxidation of ferrous bicarbonate in the water forming a brownish red deposit. This oxidation may be from added chlorine or dissolved oxygen. In high purity water systems the rouge may be of three types: Class I Rouge originating from external sources, usually by erosion or cavitation of pump surfaces. Class II Rouge originating from chloride induced corrosion of the stainless steel surfaces. Class III Rouge, either blue or black, found in high temperature steam systems. Always chemically passivate with nitric or citric acid before placing in service. Rust can cause crevice corrosion or pitting of the stainless steel under the red oxide, therefore it must be removed. This is why passivation is necessary, not only to increase the chromium to iron ratio on the surface, but also to remove any iron contamination. Both treated and untreated waters can rouge, even softened water. The culprit is what is in the water, primarily ferrous bicarbonate. Softening does not remove anions like carbonate, bicarbonate, sulfates, chlorides, etc., but only exchanges the cations like calcium and magnesium with sodium or potassium. Unlike ferric carbonate, ferrous bicarbonate is completely soluble, but is easily oxidized to ferric carbonate. Ferric carbonate is insoluble and reddish brown in color. It can be dissolved in strong acids. Ferric carbonate will precipitate and the ferrous hydroxide forms a gelatinous compound that precipitates as ferric oxide. There is a slight difference in color because the ferrous hydroxide is yellow. In large tanks the reddest deposits are usually at the top and decrease toward the bottom. It is not unusual for the bottom of a large tank to be relatively clean. Pure water and high purity water are typically used in industries where impurities can have a detrimental effect, such as pharmaceutical or semiconductor manufacturing. In the pharmaceutical industry it is called water for injection (WFI). Typical treatments include filtration, softening, anion and cation ion exchange, reverse osmosis, ultraviolet and occasionally ozonation. Distillation may be used as final purification. The result is water with extremely low conductivity. Type 316L stainless steel is the usual material of construction. Some of these systems remain clean, but others begin to rouge. Even electropolished systems with an average surface roughness less than 10 microinches (<10 m-in Ra) can rouge. In the presence of hot high purity steam these systems turn black, sometime glossy black, sometimes powdery black. Sections of rouged stainless steel piping were obtained from a number of different pure water and steam systems. The rouge layers were examined using X-Ray Photoelectron Spectroscopy (XPS), Energy Dispersive Spectroscopy (EDS) and Scanning Electron Microscopy (SEM). The SEM allows visual examination of the surface, EDS allows spot analyses of surface anomalies, and XPS allows layer-by-layer analyses of the rouge deposits and identification of the molecular species. Comprehensive reports of the findings are given elsewhere 1,2. This work allowed rouge in pure and high purity water and steam to be classified as Class I, Class II and Class III rouge depending on the mechanism of formation. External rouge can come from a number of sources. The most obvious is carbon steel in the system including tie rods, bolts, nuts, wrenches, staples, etc. The larger the source the more rouging that will occur. Pumps are prime suspects in an otherwise clean system. Two mechanisms appear to be the cause of pump induced rouging: cavitation and erosion because of impeller velocity. Cavitation usually results from inadequate water supply to the pump, improper pump selection, operation or excessive throttling during operation. Bubbles impact on a pump surface and implode, resulting in a shock wave that removes a small particle of stainless steel. Once the particle is free in the water stream it eventually is attached to the stainless steel piping by electrostatic attraction. Because the particle surface is not passivated, it immediately begins to oxidize and turn red. Erosion of the impeller is another possible mechanism. Every material has a critical velocity above which erosion accelerates3. For low alloy austenitic stainless steels this critical velocity appears to be around 100 fps. Erosion rate will vary with temperature. Type 304 Stainless Steel appears to have a constant erosion rate up to 600° F (300° C) then increases rapidly. Specific data in high purity water for the different alloys are not available. 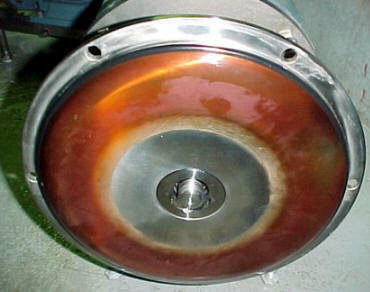 The metallurgical condition of the impeller seems to have an influence on the rate of metal removal. When the austenitic family of stainless steel solidifies from the melt two metallurgical phases are present, austenite and delta ferrite. Delta ferrite formation is dependent on the composition of the alloy and if it is less than 8% it can be dissolved by heat treatment. Cast impellers generally have high delta ferrite because of higher silicon added to promote fluidity of the steel during casting. This means heat treatment may not dissolve all the delta ferrite. The reason delta ferrite is a problem is because it erodes more easily than the austenite and is higher in iron. An eroded surface of a cast impeller is illustrated in Figure 3 and rouged pump parts are illustrated in Figure 4. This class of rouge occurs when chlorides or other halides are present. It is corrosion driven and forms on the surface of the stainless steel at the place where the passive layer is breached. Figure 5 illustrates this type of rouge which is integral with the surface. It appears more often on unpassivated and mechanically polished surfaces and may display tubercles. The stainless steel under these tubercles will be very shiny and may be pitted. When material from this rouge is analyzed, chlorides or other halides usually are present. The rouge cannot be removed by mechanically except by grinding or polishing, but most often using an acid solution. Citric acid is a good cleaning agent and will repassivate the stainless steel, but if chlorides are present the surface will rouge again. This reaction is self-perpetuating by the chloride reacting with the chromium to form hypochlorous acid as a byproduct, and the hypochlorous acid oxidizing the iron and forming more chloride. Increasing the molybdenum content of the stainless steel increases the resistance to chloride attack. Likewise, replacing the iron in stainless steel with nickel improves the corrosion resistance. This is the progression of alloys with increasing resistance to chloride attack: Type 304L (least), Type 316L, Type 317L, Type 317LM, Alloy 625, Alloys C-276 and C 22 (highest). Whenever a stainless steel system comes in contact with an acid chloride there is a potential for rouging. A pH > 7 solution will have less potential for rouging than pH < 7. Even momentary exposure to an acid chloride solution may set the stage for this type rouging reaction especially if the stainless steel surface is rough. Mechanically polished surfaces are worse than electropolished surfaces because of the microscopic crevices resulting from smeared metal from the polishing operation. Electropolishing removes these microscopic crevices and produces a passive layer with a higher Cr: Fe ratio. The crevices create concentration cells where the acid chloride solutions may be retained and continue to react, even if the system is given a high pH rinse. Use of a strong surfactant in the rinse will aid in removing the chloride. This rouge is black, not red, and forms in the presence of high temperature steam. When it first forms it is blue, then turns black as it grows to a limiting thickness that prevents further diffusion of oxygen. It may be found in high purity steam systems that operate at elevated temperatures. On electropolished stainless steel the appearance is glossy black, and on unpassivated mechanically polished surfaces it may be powdery black. Figure 6 illustrates this class of rouge on an electropolished surface forming octahedral crystals that completely cover the surface. Analysis, using XPS, shows this film is iron sesquioxide, commonly called magnetite. It cannot be removed by simple cleaning but must be removed chemically or by grinding. If the rouge is glossy black, then it may be left alone as it is quite stable. The powdery black film may slough-off and may need cleaning. After chemically cleaning, usually with hot oxalic acid, the surface must be chemically passivated. Once the system is back in service it will turn black once again, but hopefully not forming the powdery black film. Some of the iron oxide may be replaced with nickel oxide, but the iron sesquioxide will control the color of the film. Why metals corrode in the first place?